Stephen Amell gets a surprise birthday cake and engraved bottle of Gran Patron at the Fillies and Stallions Party. Sami Miro is the first woman to be featured in Reebok’s new Fusion series, which pays tribute to the brand’s newly released Fusion Flexweave sneaker by profiling individuals who fuse their passion for fitness with their art. For Sami, her passions of designing, modeling and running have helped shape who she is today and allow her to stay grounded during the daily LA grind. Victoria Justice and other celebrities, members of Congress, donors and media executives converged on the red carpet at the Mayflower Hotel by Autograph Collection last Friday for the Creative Coalition’s annual pre-WHCD gala dinner party and their landmark campaign for arts education, #righttobeararts #rtba. Halle Berry wore the People Footwear Lennon Knit Slides while showing off her perfect pedicure. Justin Timberlake makes Braspberries in brand new Bai commercial. Ted Allen, host of “Chopped” on the Food Network and author of “In My Kitchen,” snaps a selfie with high school students at the 17th Annual National ProStart Invitational on April 28, 2018 in Providence, Rhode Island. The National ProStart Invitational gives students an unprecedented opportunity to show off their culinary and restaurant management skills and compete for $200,000 in post-secondary education. Hip-Hop icon, Too $hort, celebrated his 52nd birthday at Hyde Sunset over the weekend, surprising his friends and family with an impromptu performance. Actress Dania Ramirez and Chef Joe Sasto Spotted at Cal Mare. Zooey Deschanel attends LA Food Bowl’s Power of Food event with L.A. Kitchen at the Wiltern in Los Angeles. DJ Megan Ryte celebrates at her On & On Single Release Party hosted by Stoli Vodka at TAO Downtown on April 25, 2018 in New York City. Real Housewives of New Jersey star, Dolores Catania, enjoyed a HydraFacial treatment at the HydraFacial World Tour event in New York City (May 1, 2018). Over the course of five months, the HydraFacial World Tour will travel from coast-to-coast, offering complimentary HydraFacial Treatments to consumers. At each stop, the truck will transform into a 40x40’ branded mobile spa, outfitted with four HydraFacial treatment stations and lounge. Bella Hadid congratulates Wag!, the on-demand dog walking service, on donating over 5 million meals to shelter dogs across America. Last Friday, digital savings destination RetailMeNot challenged tennis champ Andy Roddick to a shopping spree at a Sam’s Club in Austin, TX. In a 2 minute run throughout the store, Andy the chance to score $10,000 in products that will go directly to the Andy Roddick Foundation. Skincare brand SK-II has always proudly encouraged women to challenge the belief that destiny is set at birth – for both their skin and their lives – with its ongoing global #ChangeDestiny campaign. For years, the platform has inspired and celebrated the changes that women create in their lives through stories that empower them to challenge conventional norms and create their own destinies. And now, after receiving acclaim across Asia, SK-II is extending its latest #INeverExpire campaign to the U.S. as the brand continues to fuel conversations around the issues that hold women back. The #INeverExpire initiative addresses the topic of age-related pressure, inspiring women to liberate themselves from societal expectations around age and live their lives on their own terms. Walker Hayes attends the H2O+ Beauty Oasis at Stagecoach. Taylor Hill looks chic with fabulous fringe 8 Other Reasons earrings. Olivia Culpo​ celebrates 100 Years of Chevy Trucks at Boots On Stage Shindig, In The Desert Presented by Chevrolet. Audrina Patridge celebrates 100 Years of Chevy Trucks at Boots On Stage Shindig, In The Desert Presented by Chevrolet. Kate Mara designed a personalized pair of Vans to help raise awareness for the Vans Custom Culture program, an art competition built to inspire creativity and support art education in U.S. high schools. On Monday, April 23rd, Vans announced this year's top 50 semi-finalists and opened the vote up to the public to help determine the top five finalists, who will be in the running for the grand prize of $75k awarded to the winning high school's art program. The public vote will be open from 4/23-5/4. For more information and to cast a Custom Culture vote, visit customculture.vans.com. Jessica Szohr designed a personalized pair of Vans to help raise awareness for the Vans Custom Culture program, an art competition built to inspire creativity and support art education in U.S. high schools. On Monday, April 23rd, Vans announced this year's top 50 semi-finalists and opened the vote up to the public to help determine the top five finalists, who will be in the running for the grand prize of $75k awarded to the winning high school's art program. The public vote will be open from 4/23-5/4. For more information and to cast a Custom Culture vote, visit customculture.vans.com. Gavin Rossdale designed a personalized pair of Vans to help raise awareness for the Vans Custom Culture program, an art competition built to inspire creativity and support art education in U.S. high schools. On Monday, April 23rd, Vans announced this year's top 50 semi-finalists and opened the vote up to the public to help determine the top five finalists, who will be in the running for the grand prize of $75k awarded to the winning high school's art program. The public vote will be open from 4/23-5/4. For more information and to cast a Custom Culture vote, visit customculture.vans.com. Frontman of the rock group D.O.G (Dirty Old Gangsters) and actor Wass Stevens donning a custom made DKNY leather D.O.G vest at the video release party for his latest single “Not Tonight Bro” at Goldbar in NYC. Colombian sensation Karol G headlined the Latin American Billboard Awards After-Party powered by CÎROC Summer Colada. Karol performed her hit songs, including “Pineapple” at the hottest event during Latin Music’s biggest night of the year as the crowd sipped CÎROC Summer Colada cocktails. Dakota looked fab in Reformation’s Persimmon Dress as she was out and about in LA this week. Dakota’s dress retails for $198 and is available for purchase on TheReformation.com. Actress Halle Berry is spotted out running some early morning errands in Beverly Hills. Halle was rocking a pink onesie and Serge Kirchhofer sunglasses. Hailey Baldwin stepping out in a show-stopping look last night for fellow it-girl, Gigi Hadid's birthday party! It was only fitting for Hailey to celebrate Gigi's golden year in the most glamorous mini from UK-based brand, Oh Polly. Shop Hailey's sparkling style for only $70! Having taken us through many ups and downs on her previous EP’s, Grammy Award-winning recording artist and songwriter Bridget Kelly is back and debuting her first-ever full length album, Reality Bites! The album, and true double entendre, was born out of pivotal moments in her life. Kelly leans in on her playful husk and rasp, which sail creatively throughout each track as she takes fans through an array of emotions, all the while stamping her presence here on the music scene. Actress Tracee Ellis Ross turned heads at Chef Michael Mina and Chef Adam Sobel’s Beverly Hills hotspot, Cal Mare. Hilarious television mom Wendi McLendon-Covey of “The Goldbergs” smiles after loading dirty dishes into a dishwasher with new Cascade Platinum as she shows how Cascade helps helicopter cleaners relax and let the dishwasher be a dish washer on Tuesday, April 24, 2018, in New York. The Original Most Interesting Man in the World, Jonathan Goldsmith on Sirius XM’s Barstool radio. Giants star and TV personality Tiki Barber hosted a D’USSE Dinner bash at American Whiskey in NYC last week to celebrate the 1-year Anniversary of his TV show “Tiki and Tierney” on CBS Sports Network. Guests such as his co-host Brandon Tierney, Roc Nation’s Shawn “Pecas” Costner and Barstool Sports’ Julie Stewart-Binks all sipped on D’USSE. Mark Ruffalo seen wearing a UNIQLO Marvel t-shirt out in LA. Wednesday, April 25th, The Market @ Macy’s and Gen Art welcomed Gen Art Creative Director Phoebe Dahl to celebrate the Jurassic Park 25th Anniversary Collection at Macy’s Herald Square. Guests were able to preview the exclusive line and shop select items before the collection hits the floor while enjoying music from celebrity DJ, Tat de Leon. Paramore attends Live Nation's celebration of the 4th annual National Concert Week at Live Nation on April 30, 2018 in New York City. Michael Bloomberg, Georgina Bloomberg, and EEM CEO and Founder of the Longines Masters Series Christophe Ameeuw at the Welcome Party for the debut Longines Masters of New York.” Photo credit World Red Eye for EEM at Bloomberg Philanthropies. J Balvin and Bad Bunny Kick Off Latin Billboard Awards with Buchanan's Whisky. Flight of the Concords star, Bret McKenzie, hosted Sesame Street favorites Big Bird, Bert, Ernie and Rosita around his hometown of Wellington, New Zealand. They had a fun-filled day, making an unannounced appearance at Wellington’s Zealandia Eco-sanctuary. On April 19, 2018, Simon Cowell-backed boy band, PRETTYMUCH dropped their new song “Hello” in the sweetest way possible by pressing it on the first-ever cereal record made with new Kellogg’s® Chocolate Frosted Flakes™. Janelle Monáe celebrates the launch of her new album and emotion picture, Dirty Computer, with her Spotify Fans at the Mack Sennett Studios in Los Angeles on April 26, 2018. Gus Wenner and Jess Gomes attend Rolling Stone Celebrates “The New Classics” Presented by The Jeep Brand at Highline Stages in New York in honor of 20 creative visionaries who share a refusal to be contained by the rules of the past as they define the territory of the future.. For more info, visit RollingStone.com/the-new-classics. Pom Klementieff Receives The IMDb Fan Favorite STARmeter Award on the set of "The IMDb Show"
Daryl 'Moose' Johnston, Tom Ott, Richie James, Marcell Ateman, and Clarence Hill talk 'Fashion & Football' at a pre-draft party at Saks OFF 5TH in Dallas while dressed in NHP suits. CÎROC and Variety Kick-Off the 2018 Empowered Brunch Series with Priyanka Chopra and Sasheer Zamata at the New York Palace Hotel. Superstar recording artist, Yandel, took a break from Latin Billboard rehearsals to enjoy dinner at Chef Lorena’s Chica Las Vegas. On Saturday, April 21st, stars, cat lovers, and Broadway fans all gathered at the Montalban Theatre in Hollywood to see a performance of Hamilton’s Cats, which raised more than 65,000 dollars for the non-profit cat rescue Kitty Bungalow. Pictured: Nicole Sullivan, Mindy Sterling, and Kitty Bungalow Headmistress Shawn Simons. Après (drinkapres.com) along with Sophie Jaffe hosted her closest girlfriends including Erin Ziering, for a day of wellness at Pause float studio in LA. An expecting Sophie led the group with a mindful mediation chat while guests enjoyed Après beverages in Mint Cacoa and Sea Salt Chocoalte. The group enjoyed a float in the pods and Après post float for an added recovery. Model and Actress Olivia Culpo Hosts a Celebration for the TIMEX 2018 Women's Collection Launch in New York City. Culpo is the face of the new Crystal Bloom Collection. Gigi celebrated her golden birthday with her closest friends in New York City and lavish floral arrangements from Venus et Fleur. Jennifer Lopez and Alex Rodriguez at the TIME 100 Gala with drinks by Jane Walker by Johnnie Walker. Actors Emily Blunt and John Krasinski attend the 2018 Time 100 Gala at Jazz at Lincoln Center on April 24, 2018 in New York City. Robert Downey Jr. on his way to Jimmy Kimmel Live last night while promoting the newest Avenger's movie! Downey Jr. wore MOBS Tread High Style Sneaker in "Dusty Rose" to the show. He styled the trendy sneaks with a casual long sleeve tee and pants before the show and a pinstripe suit on-air. Writer, activist and TV personality Janet Mock sparkled in Forevermark diamonds at the 2018 TIME 100 Gala in held at Jazz at Lincoln Center in New York City. Mock was honored as one of TIME Magazine’s 100 most influential people of 2018. James Van Der Beek gears up for Cinco de Mayo with Jose Cuervo. Mark Wahlberg, Kid Rock and more joined golf legends Gary Player and Jack Nicklaus on Sunday, April 22 to mark the final day of the Bass Pro Shops Legends of Golf at Big Cedar Lodge. Stars and golf legends descended upon Missouri’s Ozark Mountains to team up and compete during a Bass Pro Shops Legends of Golf Celebrity Shootout on the Jack Nicklaus-designed Top of the Rock course. Chloe Grace Moretz celebrates The Miseducation Of Cameron Post at the Supper Suite at The Seville during Tribeca Film Festival presented by Altec Lansing and Essentia water. Lakeith Steinfeld stopped by The Miseducation of Cameron Post film reception at Supper Suite at The Seville where guests enjoyed Ciroc vodka and Deleon Tequila during Tribeca Film Festival. HealthCorps Celebrated Their 12th Annual Gala Honoring Elvis Duran Co-Hosted By Dr. Oz and Lisa Oz April 23rd at The Ziegfeld Ballroom. Actor Justin Baldoni and his wife, Emily, mix peanut powder with water to feed to their son Maxwell at their home in Los Angeles. Baldoni is partnering with National Peanut Board to share his journey of introducing peanuts early to Maxwell to drastically reduce his chances of developing a peanut allergy. American Airlines, Marvel Studios' "Avengers: Infinity War", Stand Up To Cancer unveiled a customized American Airlines aircraftas part of their larger PSA campaign to raise funds, awareness and further SU2C mission to bring groundbreaking therapies and treatments to patients as quickly as possible at Los Angeles International Airport on April 23, 2018. Laverne Cox wears Urban Zen at Beautycon Festival NYC 2018. Olympic Fencer and Red Bull athlete Miles Chamley-Watson was recently spotted at the launch of the Red Bull x Live Nation Festival can, which will be the first to feature UV blacklight technology- and the launch of an exciting festival game that will give winners a once-in-a-lifetime prize. Along with their partners Bonnaroo, EDC Las Vegas, Governors Ball, Lollapalooza and Austin City Limits Music Festival, Red Bull is launching the Red Bull Festival Run game, which gives music lovers across the country the chance to win epic VIP festival experiences, tickets and more at the five festivals in 2018. The contest is running now and will end on 4/30. Red Bull and Live Nation are celebrating the 2018 music festival season with the launch of their soon-to-be-released Red Bull Festival Can, which will be the first to feature UV blacklight technology- and the launch of an exciting festival game that will give winners a once-in-a-lifetime prize. Along with their partners Bonnaroo, EDC Las Vegas, Governors Ball, Lollapalooza and Austin City Limits Music Festival, Red Bull is launching the Red Bull Festival Run game, which gives music lovers across the country the chance to win epic VIP festival experiences, tickets and more at the five festivals in 2018. The contest is running now and will end on 4/30. Olympic Fencer and Red Bull athlete Miles Chamley-Watson chats with DJ Quiana Parks at the launch of the Red Bull x Live Nation Festival can, which will be the first to feature UV blacklight technology- and the launch of an exciting festival game that will give winners a once-in-a-lifetime prize. Along with their partners Bonnaroo, EDC Las Vegas, Governors Ball, Lollapalooza and Austin City Limits Music Festival, Red Bull is launching the Red Bull Festival Run game, which gives music lovers across the country the chance to win epic VIP festival experiences, tickets and more at the five festivals in 2018. The contest is running now and will end on 4/30. Former NFL player Devon Still and wife Asha cross the finish line at the Damon Runyon 5K at Yankee Stadium on April 15, 2018, an event which raised over $400,000 for innovative cancer research. did something pretty fun for the upcoming holiday (4/20) 💖 Can’t wait to share! Model Ireland Basinger Baldwin spotted going green with MedMen at a recent 4/20 photo shoot. Cyndi Ramirez-Fulton seen chillin' at the launch of The Chill Times at LES's Chillhouse sipping on Avion Tequila cocktails while getting nail art in CND polish. Guests enjoyed mini flows by Y7, hair styling by Bumble and Bumble, and consultations by Heyday. Paris Jackson goes Peach Rose for Coachella with Joico’s Lumishine & Color Intensity. Macy’s Herald Square and Nicopanda welcomed guests to an exclusive Nicopanda Ball celebrating the launch of the special apparel collection, sold only at Macy’s, as well as the MAC x Nicopanda collaboration. Guests watched Nicola Formichetti’s celebrity and influencer friends strut in a flash runway show that took over the main floor of Macy’s Herald Square. After the fashion show, customers had the chance to meet Nicola and the stars of the show including, Serayah, Nico Tortorella, Jazelle Zanaughtti, Desmond, Gigi Gorgeous, Nats Getty, Naomi Smalls, Aquaria, and more. Vicky Cornell, widow of Soundgarden's Chris Cornell sits down with Dr. Oz. Paris Jackson celebrates her 20th birthday with Chris Brown, Ashlee Simpson, Paris Hilton and more stars at Hyde Sunset. The Bachelor stars Arie Luyendyk Jr.(Center R) and his Fiancee Lauren Burnham (Center L) meet with WE tv's "Marriage Boot Camp: Reality Stars Counselors Dr. Ish (R) and Dr. V (L) over lunch at the Arizona Biltmore on April 10, 2018 in Phoenix, Arizona. Industry leaders and film experts including Alexander Dinelaris (Writer/Producer), Ilana Glazer (Actor/Writer/Producer), Robert De Niro (Actor), Lisa Cortes (Director/Producer), Griffin Dunne (Actor/Director/Producer), Alfre Woodard (Actress), and AT&T Chief Brand Officer Fiona Carter congratulate aspiring filmmakers Sasie Sealy and Angela Cheng after winning AT&T Presents: Untold Stories 2018, an inclusive film program in collaboration with Tribeca. Sealy and Chang are the second annual winners to be awarded $1,000,000 and will use the funds to create and finish their winning film “Lucky Grandma,” which will premiere at the 2019 Tribeca Film Festival. Amanda Seyfried attends the 3rd Annual Best Friends Animal Society Gala To Save Them All at Guastavino’s in NYC, where she was honored for raising awareness about animal welfare. Epitome of “Modern Masculinity,” Actor and Old Spice Guy Terry Crews flexes his teaching muscles for the Old Spice “Let’s Get Contempor-MANLY” livestream, a marathon of 80 manly tasks in 80 minutes in honor of the the grooming brand’s 80 year heritage of helping guys, Monday, April 9, 2018 in New York City, New York. Insta-famous rescue pup Cheese (@toastmeetsworld) poses in front of ROADM8, Super 8's road-trip-ready concept car, at the 2018 New York International Auto Show. The car's unique features include hotel bedding turned upholstery, an in-console mini fridge, built-in coffee maker, and tablet entertainment inspired by Super 8’s newly redesigned rooms. Visit super8.com/roadm8 to learn more, and to see which pet-friendly location is closest to you. Houston Rockets Point Guard James Harden stands alongside “Get Inside Harden’s Head,” the State Farm® 3D installation at the Rockets Liftoff party at Toyota Center in Houston, TX on April 7, 2018. State Farm invited fans inside the installation to play an interactive game to clear Harden’s head of distractions before the game. Demi Lovato on set with CORE Hydration, the premimum pH balanced water, to shoot their new “Finding Balance with Demi Lovato” campaign. America’s favorite it-girl, Vanessa Hudgens recently debuted new colorful hair as the newest Matrix SoColor Icon! Matrix Celebrity Stylist, Nick Stenson created two different looks with vibrant pink hues to perfectly complement her style and effortless look at the Ulta Conference in Houston. Ashley Greene gets some shopping while using the ullu iPhone 6+ Premium Leather Wally Case in Indian Pink. Belgian DJ and record producer Dimitri Vegas enjoyed his trip to the U.S. with a visit to Universal Studios Hollywood on Tuesday, March 27, 2018. At an event announcing the Filter for the Future Grant Program, an effort to help schools limit bottled water waste superstar Stephen Curry handed out water to children playing a pick-up game at the East Oakland Youth Development Center in Oakland, Calif. on Friday, March 30, 2018. Last night in Manhattan at The Roxy Hotel, Etienne Aigner celebrated with The Cinema Society, the NY premiere of Love After Love - starring Andie MacDowell and Chris O’Dowd. Andie carried the Etienne Aigner Lana crossbody handbag in black. 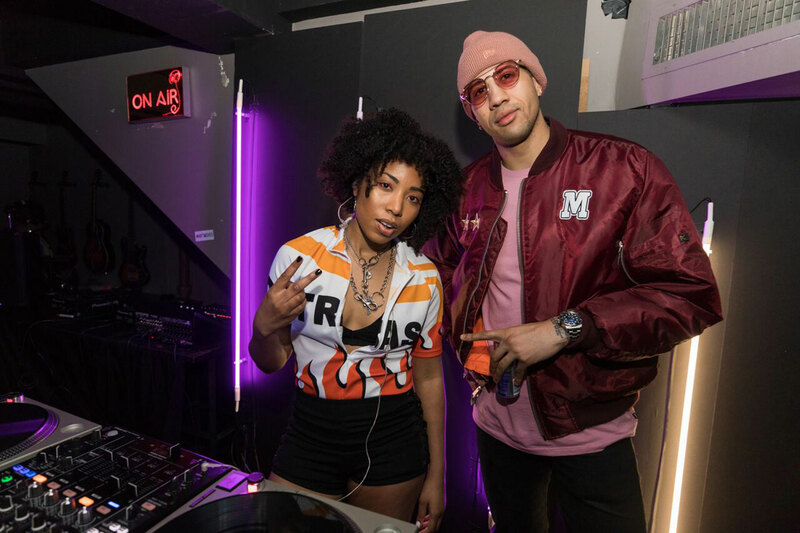 Olympic Fencer Miles Chamley-Watson and DJ Quiana Parks celebrate the launch of Red Bull’s limited edition festival can in collaboration with Live Nation at E&C Studio. Julianne Hough and Brooks Laich have teamed up with Propel to show what it means when we say “How Gatorade Does Water”. Jules and Brooks both lead very active lifestyles, but their workouts, intensity and hydration needs vary greatly. Julianne has seen how Gatorade fueled Brooks’ hockey training and games, but also knows that she doesn’t necessarily need the fuel Gatorade provides. That’s why Propel is her drink of choice giving her the same amount of electrolytes as Gatorade, replacing what she loses in sweat with zero calories and sugar. Grammy Award-winning recording artist and songwriter Bridget Kelly debuted the highly anticipated visuals to her introspective single “Sedated.” The visual marks the first of what’s to come off her debut album Reality Bites debuting April 27th. Kelly burst onto the scene with piercing tracks like “Special Delivery” before gracing us with her infectious and endearing personality on the TV screen. Nicky Hilton Rothschild American businesswoman, socialite, model and fashion designer was seen in Los Angeles debuting her latest collection, Nicky Hilton x Tolani and hair styled by Matrix. Teddi Mellencamp the newest addition to Real Housewives of Beverly Hills and daughter of John Mellencamp was seen in LA debuting hair by Matrixand a bag by Hammitt.